US Army deserter Richard Rouse gets a job at Fengxian Amusement Park, a family destination heavily “inspired” by Western culture, featuring Rambi (the deer with the red headband), Ratman (the caped crusader with a rat’s tail), Bumbo (small ears, big behind), and other “original” characters. But when American terrorists take the festive park - and his family - hostage, only Ricky Rouse can save the day. In a furry costume. 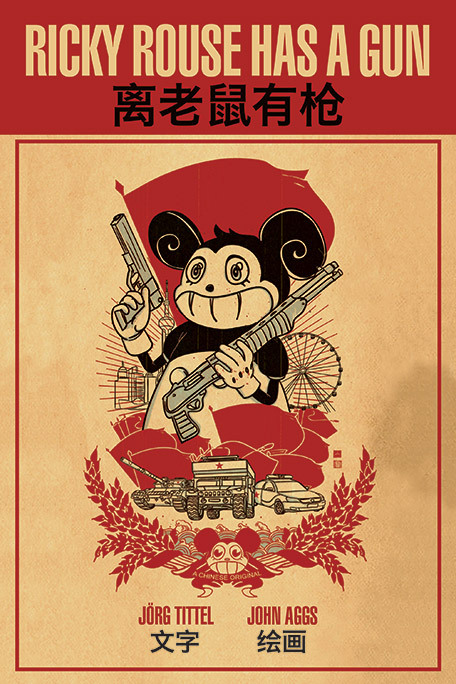 Ricky Rouse Has a Gun takes a curious look at China – a country that, once we look past its often outrageous copyright infringements, is ripe with innovation and a unique, courageous spirit. Jörg wrote the book and conceived a cryptic, satirical online campaign (RickyLeaks), and directed the live-action music video featuring an original track by James Lavelle (Unkle) and a full-size Ricky Rouse costume.